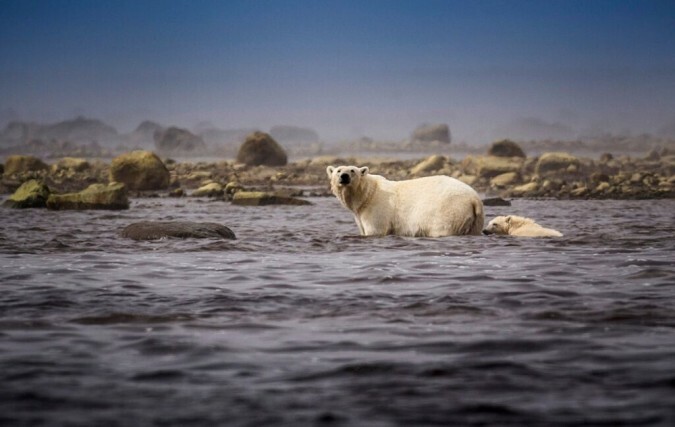 Eye to Eye with Ursus Maritimus—Photojournalist John Lehmann's intimate Northern encounter. I lead an embarrassingly rich visual life as a professional photographer. 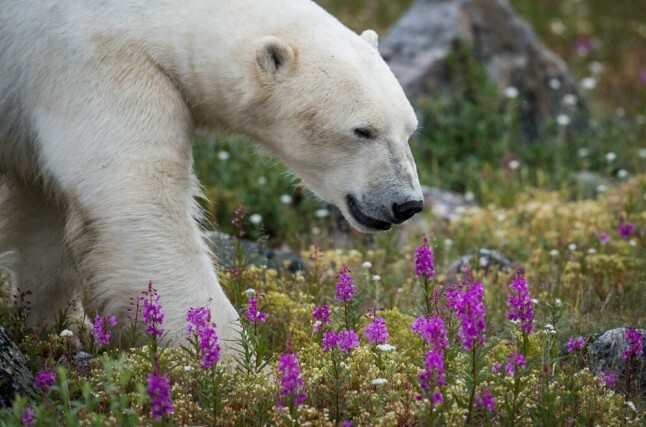 But for years I’ve dreamed of capturing images of polar bears—not in the dead of winter but during the long days of summer among the wildflowers of the northern tundra. 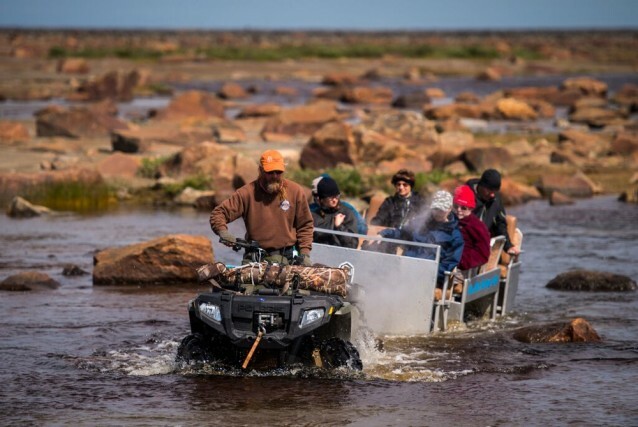 Fortunately, this past summer I had the rare opportunity to visit Churchill Wild’s Seal River Heritage Lodge, an eco-friendly operation that sits on the shores of Hudson Bay in a well-established wildlife corridor. I can tell you now that, in my opinion, there’s nothing more Canadian than watching a giant, ever-so-slightly-off-white polar bear lumbering across a Northern Manitoba landscape, or sitting regally atop a large rock in a misty field of boulders looking like the oversized stuffy you might win during a game of ring toss at a country fair. Owned and operated by husband-and-wife team Mike and Jeanne Reimer, Churchill Wild has created a uniquely intimate experience. Each day, along with two guides, we head out with a small group, approximately 16 people (at most) from Canada and around the world. 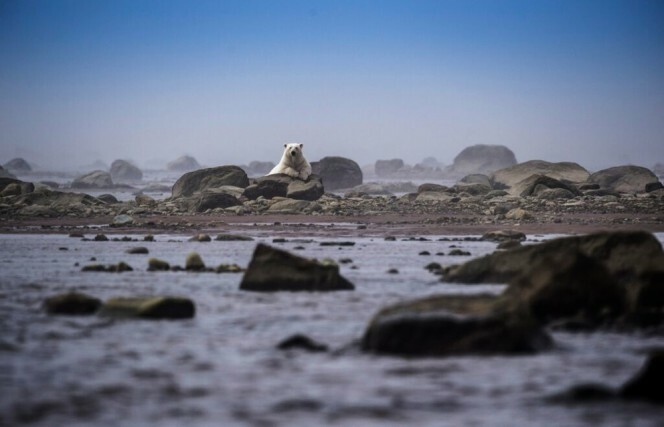 We’re offered a variety of options for observing polar bears: on short hikes from our accommodations; from the sea in a Zodiac; on a passenger trailer pulled by an ATV vehicle (something akin to the lunar rover); and, from the cozy confines of the lodge while sipping hot mugs of coffee. 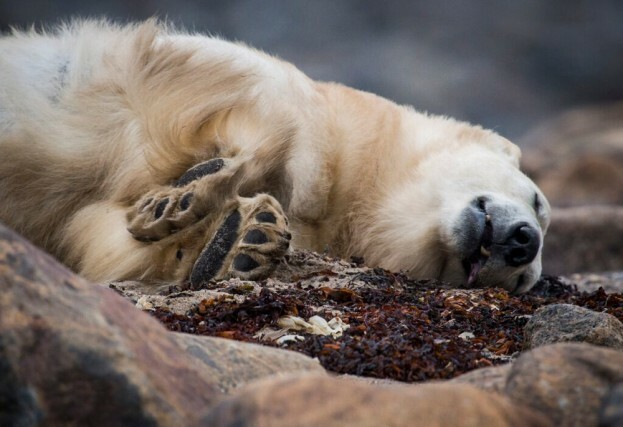 Close proximity to polar bears is precisely what photographers like me dream of—the opportunity for an original angle and an eye-level experience. This is made possible by Andy MacPherson, the outfitter’s resident naturalist and adventure guide. Returning guests call him “the polar bear whisperer.” He’s passionate about the bears, the quality of his tours and safety. 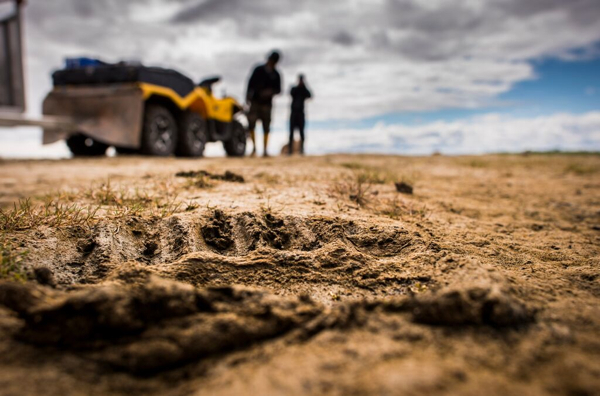 After five incredible days of hanging out with MacPherson—adventuring with him through the bush, over rocks, across the water and on wheels—I get the polar bear whisperer reference. He has a shotgun, which he never has to use, and a starter’s pistol, which he has used. His main “weapon” is his calming voice, one he employs to reassure the bears that we mean no harm as we approach from a safe distance. MacPherson guides our group with a keen awareness and a palpable respect for our arctic environment. By far, the best viewing I experience is from the icy waters of the Hudson Bay. But everything you do in the North is weather dependant and with weather tilting quickly from one extreme, Zodiac rides aren’t always an option. There is such an abundance of animals during my short stay in this remote corner of Canada that meals at the lodge are frequently interrupted. Guests leap from dinner to grab whatever device they have handy—anything from pro-gear to an iPhone. 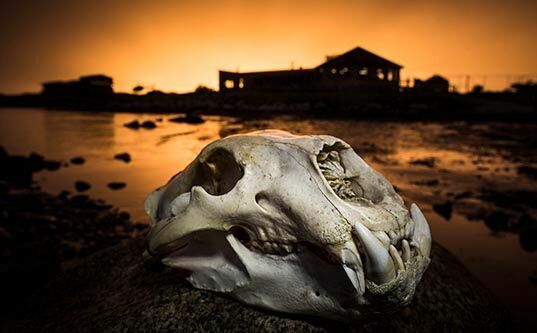 Outside the lodge (seen below with a polar bear skull in the foreground), one bear (seen above) acts like a big, furry rock star, strutting the “red carpet”—a bed of fuscia-coloured fireweed—and stopping to pose about every 10 meters for snap-happy guests. The small herd of photo-hungry visitors, of which I am one, follow our celebrity around the lodge, stepping quietly through the building from window to window and from deck to deck until the creature is out of camera range. We return to our meal to find the food has been kept warm by lodge staff who have grown accustomed to the impeccable timing of these Arctic lords. Do I have any advice for travellers interested in a trip like this? Bring a good backpack because you’ll be hiking. A lot. And if you’re a photographer, bring a good-sized quality dry bag for Zodiac adventures. I use a Gura Gear camera backpack. Speaking of gear, I highly recommend a 500mm lens, even though a lens as short as 300mm will get the job done. A bug jacket and a netted mask are must-haves, along with good comfortable rain boots. The lodge provides boots, but your own always fit and feel better. How will I remember this trip-of-a-lifetime? I was struck I was by the sheer size of polar bears—with the males reaching as high as ten feet tall on their hind legs and weighing between an average of 775 and 1200 pounds. And I was mesmerized by the relaxed, constant pace at which these animals move. 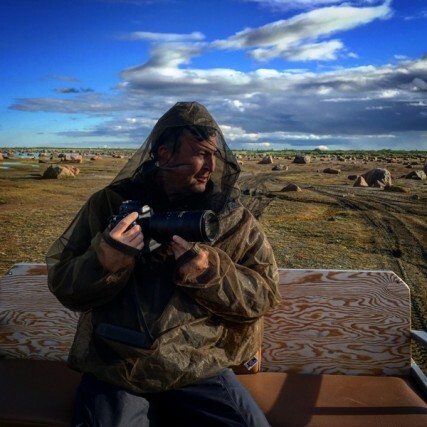 Editor’s note: John Lehmann‘s visit to northern Manitoba was supported by Churchill Wild and Travel Manitoba. A warm thanks to our partners, who did not review or edit this post before publication, for their support. 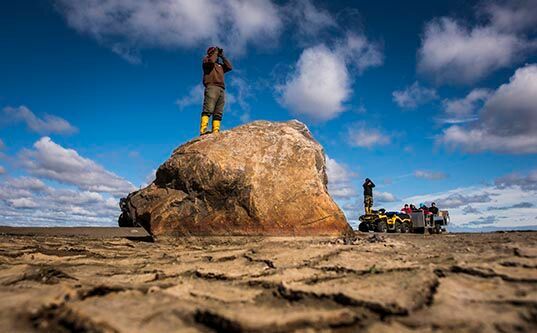 For other Toque & Canoe stories featuring Manitoba, check out Cold Land, Warm Heart: Val Berenyi seizes Winnipeg with both mittens, Lords of the Arctic, Reeling with Memories, and Diner Dashing in Winnipeg and beyond. Interesting story! It is on my bucket list…hopefully it will come true sooner rather than later. You are the first person to mention the bug-net…and I appreciate that . A great story with fabulous photos that captures the essence of the north. It is truly a life-changing destination that is representative of the people of Manitoba. WOW! Thank you so much for these beautiful pictures.